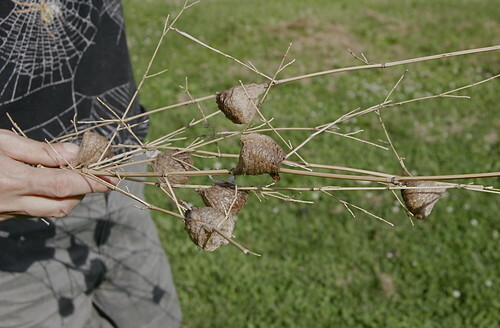 A bunch of praying mantis pods were recovered from the burn pile yesterday. 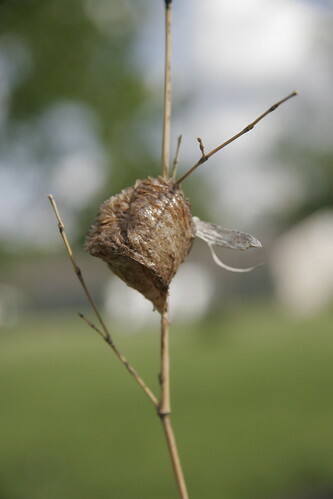 The pods were attached to last year’s bamboo growth and were cutout when the grove was thinned. Ronna found them in the brush pile and saved them because she thinks they’re beautiful. They’re now nicely displayed on our kitchen table as an interesting conversation piece. When I saw this on the table today I thought they were dried flowers or something! But they do look great in the Jesus candle.